No need to wait until lunch or dinner, start your fried food journey with breakfast. The deep-fried breakfast is composed of breakfast sausage, bacon, ham, hash browns, cheese and eggs assembled between two pieces of French toast. The concoction is then wrapped in a cinnamon roll, coated in cinnamon batter then fried and topped with real berries and maple syrup. Don’t blame us if you’re too full after to try our next items but it’s certainly a delicious way to start your day! A Great New York State Fair staple, the Big Kahuna Donut Dog delivers something for both the salty and sweet loving fair-goers. This menu item is the best of both worlds. It consists of a hotdog wrapped in bacon with a maple glazed Long John donut serving as the bun. Can’t decide which food item you want to treat yourself with during your visit? Why not try them all in one meal. Jim Hasbrouck’s Fried Specialties pushes the limits with this one but nevertheless makes it a unique Fair food item not to miss. The Difibulator is made up of an angus beef burger, topped with deep-fried pickles, deep-fried cheese curds, deep-fried bacon slices then topped with cheddar cheese all between two grilled cheese sandwiches. Hailing from the South this stand certainly does its thing in Syracuse during the Fair by offering an adventure for foodie fairgoers. The Gator Mac n’ cheese consists of a heaping boat of mac n’ cheese topped with delectable fried gator pieces. It’s not one to miss! Your traditional Thanksgiving meal might not compare after trying this one as it combines the best of the Holiday with fried Fair goodness. This item starts with turkey, mashed potatoes, stuffing, and bacon- which is then all deep-fried to perfection. The Harvester is then topped with cheese and cranberry sauces and placed between two slices of sourdough bread. Jim Hasbrouck once claimed he can fry anything, known for testing the limits of fried goodness he has now decided to offer chocolate covered deep-fried crickets and grasshoppers on a stick. For culinary dare devils, we commend the bravery of anyone who decides to try this one. 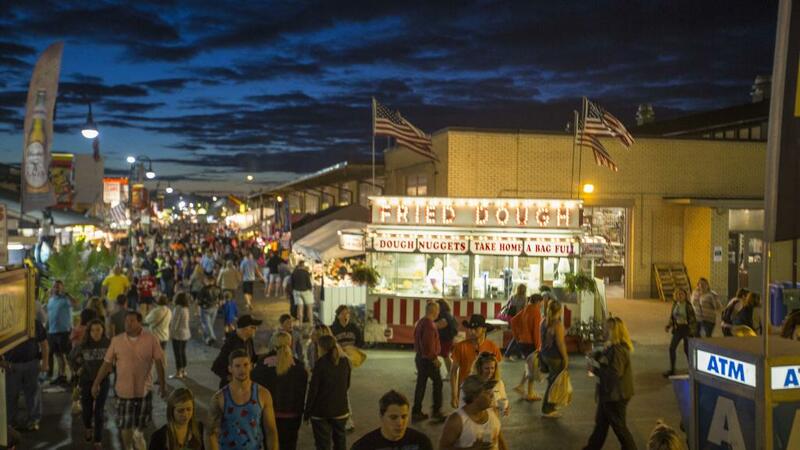 All of these items might take a few hundred laps around the midway to burn off, but there’s no other way to treat yourself than by pigging out at the Fair. Enjoy your visit to The Great New York State Fair and you can thank us when you bite into one of these fried masterpieces.